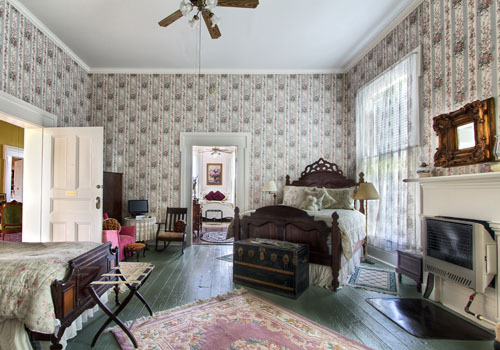 Featuring a high-arch Antique Queen-size Bed and Two Twin Beds with inlaid wood and six legs, all with luxury linens/extra-plush pillows and fiberbeds. The lovely wall covering is designed with tea roses and crested with crown molding. 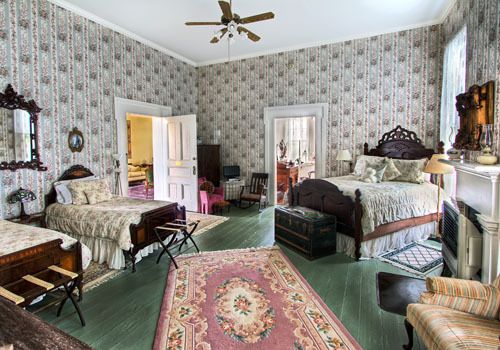 This rooms windows have beautiful views of the Wedding Gazebo & Flower Gardens and a lake of “Uncle Tom’s Cabin.” Books written by Harriet Beecher Stowe can be found for you to enjoy. 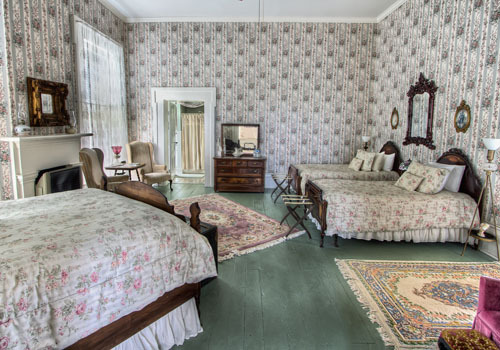 This room may adjoin with Clara Barton Room AND/OR the McElroy Honeymoon Hideaway for extended family or friends – ideally suited for Girlfriends Getaways. (Additional Guest Fees: $35/Adult or $20/Child 12 years or younger).